Maybonne | What Can I Say ? 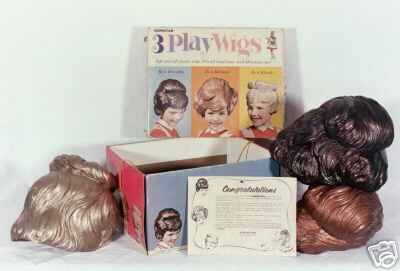 I’d heard that these wigs were popular with little girls in the 1960s, but had never actually seen them. Cartoonist Lynda Barry once did a strip featuring them (and the trauma a character experienced after buying them). They do look pretty terrible, actually– like piles of dog crap. But I suppose, when you’re little, you’ll wear anything. Well, I can identify with Lynda Barry’s character– little Marlys was just as upset as I was when they arrived at MY house. Yes, I won the eBay auction. For a mere bag of shells I am the proud owner of these plastic wigs– and they’re even more horrible than I dared hope. First, the box promises three different hairstyles, but two of the wigs are simply the same style in different colors. There’s no big bombastic red Baptist lady hairdo like on the box– the red wig I received is just another version of the brown wig. Second, they smell- not like unwashed bodies or the backyard behind a pet store; these plastic wigs have a chemical smell which probably results from the sinister by-products used in the manufacturing process. Frightening things are being released into the atmosphere every time I remove them from the box. I’ll bet these wigs are responsible for global warming! Third, they are very tight– they may fit a little girl’s head, but they do NOT fit Mommy’s head like the instructions promise. Nor do they fit Daddy’s head. (That would be me.) When they arrived at work from eBay, we all tried them on, and they fit nobody. And I wouldn’t dare try them on a real little girl. To recoup my investment, albeit minimal, I will rent these out to anyone interested. Interested? Leave a comment!